Start by bringing two pots of water to boil. Separate the lentils and millet in each pot and cook until soft. Drain, rinse and mix together until well combined. Add the garlic paste, onions, salt, pepper, chilli and mash until soft and mushy paste. Only add the ground almonds and buckwheat flour if the mixture is too wet and you need to make it more dry. Then roll in balls, put on a plate and pop into the fridge to set before frying.Once set, prepare 2 bowls. One with an egg whisked and another 2 with some buckwheat flour. First dip the balls in one batch off flour, then egg and then roll in flour again. Do this with all the balls before frying. Once all the balls are coated and ready to go, put enough oil to cover the surface of the pan and let it heat up. When it is extremely hot, add the balls and fry them on a low heat and cook on all sides. 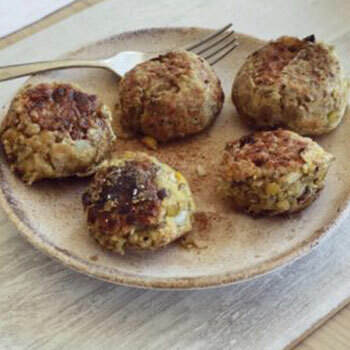 Once the balls are all cooked, apply them to a plate with some tissue so as to remove any excess oil and enjoy.